Green is the new pink…. when it comes to smoothies, that is! Before your inner skeptic kicks in and you stop reading, consider the many benefits of green smoothies. Heighten nutritional value. Adding leafy greens to your fruit smoothie is a great way to boost vitamins and minerals in your diet. Sneak attack. If you or your family members don’t like veggies, blending some in a smoothie is a great way to expand their nutritional palate. Boost your fiber. The fiber from pureed fruits and veggies in green smoothies helps keep you full longer and provides a steady stream of energy throughout the day. If you are new to the world of green smoothies, here are some tips to help you get started. Add fruit to tone down or mask the veggie flavor. Start small and gradually add in more and more veggies over time as you shape your taste buds. Puree your greens and liquids before adding in your fruit to reduce the amount of leafy chunks. 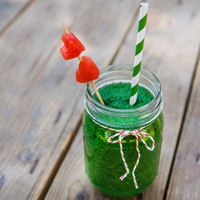 Name green smoothies fun, kid-friendly names such as the Jolly Green Giant or The Hulk to encourage your children to try new flavors. Experiment and try new flavor combinations and recipes! Blend together spinach and 1 cup almond milk. Add fresh and/or frozen fruit and flaxseed. Blend adding more liquid until desired consistency is met.